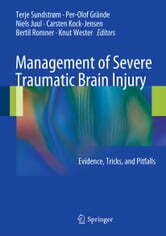 In order to reduce the number of deaths from severe head injuries, systematic management is essential. This book is a practical, comprehensive guide to the treatment of patients (both adults and children) with such injuries, from the time of initial contact through to the rehabilitation center. Sections are devoted to prehospital treatment, admission and diagnostics, acute management, and neurointensive care and rehabilitation. Evidence-based recommendations are presented for each diagnostic and therapeutic measure, and tips, tricks, and pitfalls are highlighted. Throughout, the emphasis is on the provision of sound clinical advice that will maximize the likelihood of an optimal outcome. Helpful flowcharts designed for use in daily routine are also provided. The authors are all members of the Scandinavian Neurotrauma Committee and have extensive practical experience in the areas they write about.